the displayed wavelengths and didn't make much more effort with that approach. So, I'm going to try an experiment with a low cost fiber optic spectrometer from ThorLabs, which provides optical equipment and spectrometers for commercial laboratories for chemical analysis. I haven't seen any published papers that say this device will work for stellar spectrometry, but had heard one of the visiting professors at a recent OCA meeting say that some of his students had coupled another type of laboratory spectrometer to a telescope and had made some stellar spectrogram measurements. So, rather than go with the tried and true astronomical spectroscope made by Shelyak, which is way too expensive for my interests, I'm going to investigate the use of this other product. The ThorLabs product comes with free software for preparing spectrograms and includes calibration to laboratory wavelength standards. The first photo image shows a web page photo of the fiber optic spectrometer. So how do I see this device working for me? First, my plan is to attach my flip mirror assembly to the scope and attach an eyepiece in one of the optical ports and put a fiber optic cable adapter in the other port. Then I can set the mirror to the eyepiece position so that I can center the subject star in the eyepiece. Then by flipping the mirror the centered star will impinge on the fiber optic coupler that goes to the spectrometer. Coupling starlight to a fiber optic cable, which is only 0.05 millimeters in diameter could cause a major alignment problem, if the fiber has to be brought into alignment with the star. But, I believe that I can pretty much collimate the star light with a device called a cosine corrector. This device connect directly to the cable and accepts light over about a 2 mm diameter, regardless of the incoming angle, and sends it down the fiber optic cable. Since I am not interested in any image distortion, as long as the cosine corrector is within a millimeter or so of where the star image would have formed, then all of its light will be passed on to the spectrometer, and achieving a good focus should not be necessary. At least, that's what my preliminary analysis shows. It might be I will need to do more consulting with a real optical engineer, but for now this is my going forward approach. This is going to be an experiment because I don't quite know for sure that all of this will work, but it is low cost, about 1/5 the cost of the Shelyak system, enough for me to try this idea out. So, once all of this equipment arrives, the experiment begins. In the meantime, I couldn't resist getting another full moon photo. This time, just the morning after Thanksgiving, I used the tripod and camera to take two images of the full moon. I wanted to include the foreground trees and clouds in the image so I took one photo with 1/6 second exposure and one photo with 1/1000 second exposure. The long exposure showed the foreground trees and clouds and the short exposure showed some of the details of the full moon. Then I tried to remember how to use Photoshop to combine both images in a composite image so both views could be seen in the same image. 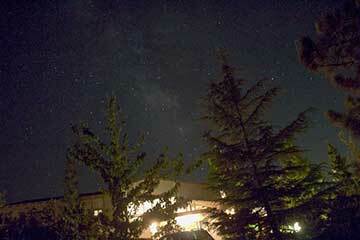 The two attached images show the long exposure and then the composite image. What do you think? I'm still trying to remember and figure out how to use Photoshop to stick together two images on a seamless fashion and still have some learning to do. Finally, I should mention our Thanksgiving day visit with old friends and Therapist and Author, Heidi and her children. We knew that Teenager and Aspiring Musician, Kody's dog had puppies and they were looking for a good home for one of the puppies, but we didn't quite realize that what they meant by "good home" was our home. So with a concerted plot to convince the Palmia Observatory resident astronomers to take the puppy, we were plied with turkey, mashed potatoes, vegetables, stuffing, alcohol, and pumpkin pie. Also everyone was on their best behavior, even the puppy, who was especially mellow and calm. Even Astronomer Assistant Danny inspected the new puppy and concurred that yes she was an acceptable puppy. So a warning to everyone else, when it comes to folks who you have known for 30 years, remember they know your weaknesses and can craft a non-refutable argument. So we came for turkey dinner and went home after a very pleasant evening with the puppy. So, I want to introduce the newest member of the observatory staff, Astronomer Assistant, Ruby. I tried to get her to read up on cosmology, but as you can see, she was having nothing to do with it. Maybe with time, after all of the chewing and such she will get back into it. Well maybe not. We will just have to love her. By the way, if you are interested in studying cosmology, the Ryden cosmology book is one of the best. Of the dozens of books I have on the subject, she covers the details with just the right level of mathematics for us physicist wannabes.